Property Location With a stay at DoubleTree by Hilton Hotel Newark Ohio, you&apos;ll be centrally located in Newark, steps from Midland Theater and minutes from The Works Museum. 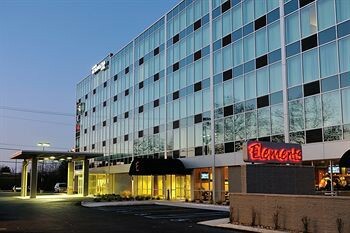 This hotel is within close proximity of Heisey Glass Museum and Newark Earthworks.Rooms Make yourself at home in one of the 118/13 air-conditioned rooms featuring refrigerators and flat-screen televisions. Complimentary wireless Internet access keeps you connected, and cable programming is available for your entertainment. Private bathrooms with bathtubs feature complimentary toiletries and hair dryers. Conveniences include phones, as well as laptop-compatible safes and desks.Rec, Spa, Premium Amenities Don’t miss out on recreational opportunities including an indoor pool and a fitness center. Additional features include complimentary wireless Internet access, gift shops/newsstands, and wedding services.Dining Enjoy a satisfying meal at a restaurant serving guests of DoubleTree by Hilton Hotel Newark Ohio. Quench your thirst with your favorite drink at a bar/lounge.Business, Other Amenities Featured amenities include a 24-hour business center, a computer station, and express check-out. Planning an event in Newark? This hotel has 5000 square feet (450 square meters) of space consisting of a conference center, conference space, and meeting rooms. Free self parking is available onsite.